Bonhams joined the Arizona auction extravaganza this year, finding a choice location at the Westin Kierland Resort just across Scottsdale Road from the Scottsdale airport, about as centrally located as it’s possible to be and verdantly situated in something of an oasis of green grass, manicured bushes and plentiful close-in hardtop parking. It was refreshing and rivaled RM’s Phoenix location at the Biltmore but with more grass. Grass is a rare luxury in Scottsdale, the antithesis of dust, gravel, cactus and prickly bushes that are the Valley of the Sun’s native environment, as pretty much anyone who’s parked at WestWorld knows only too well. 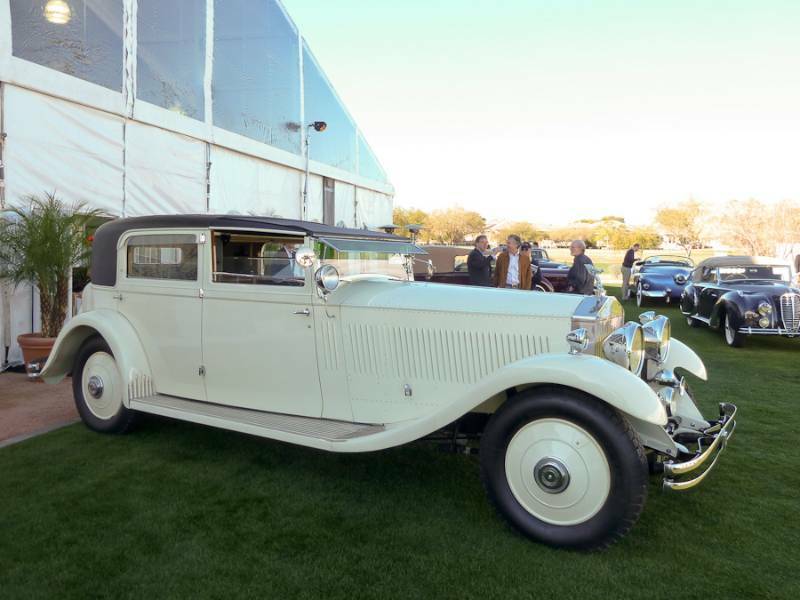 With a 64.7% sale rate and just under $6 million total Bonhams didn’t set any Scottsdale records but the cars on offer were better than the numbers indicate, particularly the ex-Marlene Dietrich Rolls-Royce. The Stutz faux-Bearcat was a driver’s dream and several barn-find cars excited the bidders’ imaginations. The sale started in Bonhams’ style with a choice selection of automobilia and art highlighted by an offering from David E. Davis’s collection that had collectors in their seats early, holding their paddles in the air with determination. First time in Scottsdale? 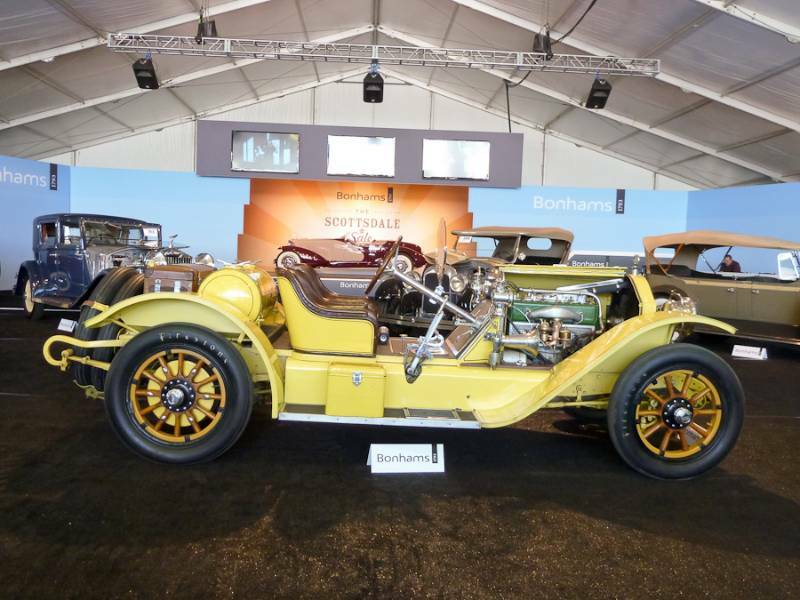 Bonhams did it right and set themselves on a path to success. Ed Lenahan ably assisted in reviewing the Bonhams cars. A full list of the cars offered is found here. 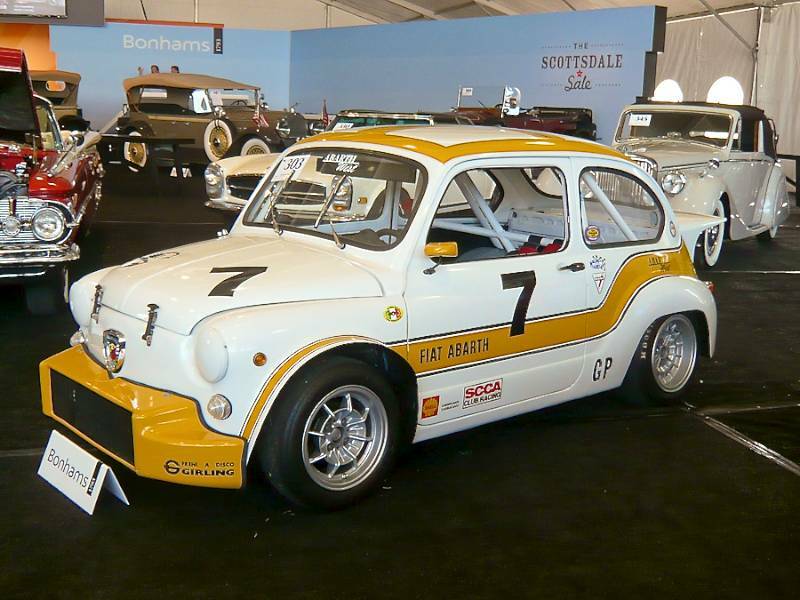 Lot # 303 1967 Fiat Abarth TC Berlina Corsa; S/N 1667; White, Yellow/Black; Estimate $50,000 - $70,000; Modified for competition during restoration 3- condition; Hammered Sold at $40,000 plus commission of 17.00%; Final Price $46,800 -- 1050cc/110bhp, 5-speed, limited slip, oil cooler, Girling disc brakes, stripped interior, roll cage, 5 point racing harness, fire system, metal front flares, fiberglass rear flares, contemporary formula-car driver's side mirror, painted Campagnolo cast wheels with Hoosier race tires. Paint and bodywork wears evidence of recent racing. Lots of dings and chips. Driver's side fender has cracked paint. No show car, this, but a credentialed car for the track described by the consignor as "The fastest Berlina Corsa on the West Coast" with race results to prove it. Professionally built to high standards of fit, finish and function, this is a long-raced car restored with correct, but not original components. The downside is that it didn't attract as much money as a completely original car. 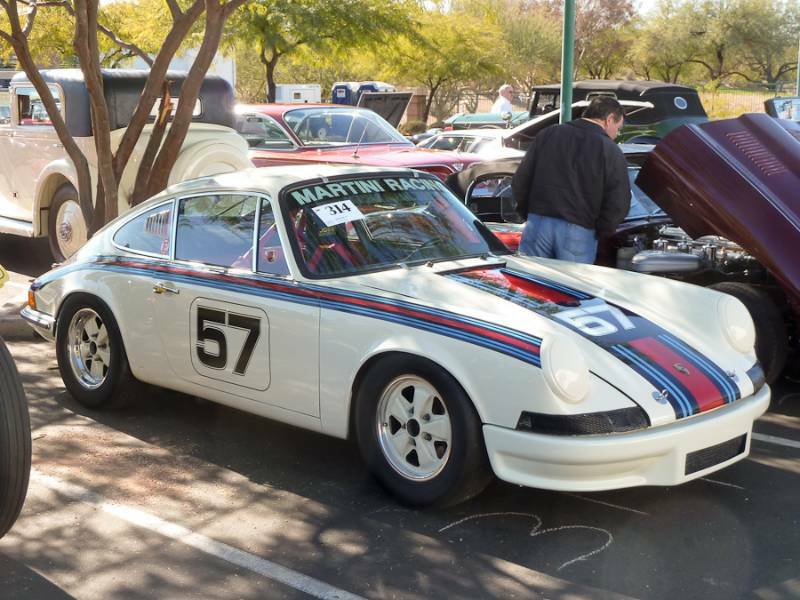 The upside was that the new owner purchased a pedigreed and competitive historic race car for relatively little money. It is a great value to a competition oriented buyer. 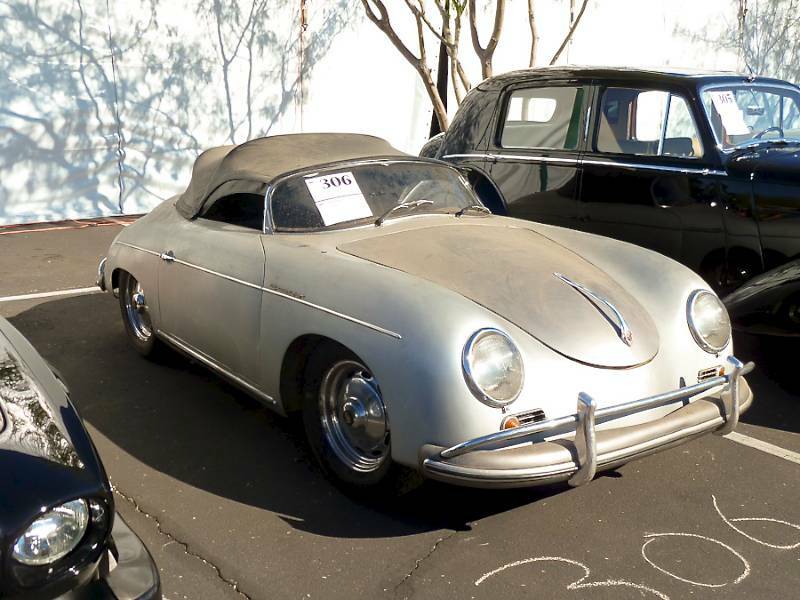 Lot # 306 1955 Porsche 356A Speedster, Body by Reutter; S/N 80697; Engine # P35285; Silver/Black leatherette; Black leatherette top; Estimate $80,000 - $100,000; Unrestored original, 4 condition; Hammered Sold at $86,000 plus commission of 17.00%; Final Price $100,620 -- Chrome wheels, Prototipo leather rim steering wheel, four hubcaps. bumper overriders. Barn find. Dull paint, stiff upholstery, stripped dashboard but little rust; new floors and battery box included. Nose has been repaired. Titled under the engine number; the engine has been removed and disassembled. This was the first of several barn finds Bonhams brought to its first Scottsdale sale and represents a straightforward restoration project, albeit one that will need to be complete and will almost certainly involve sourcing some incredibly hard to find two dollar part. It should be fun, but at this price it will not be financially rewarding. 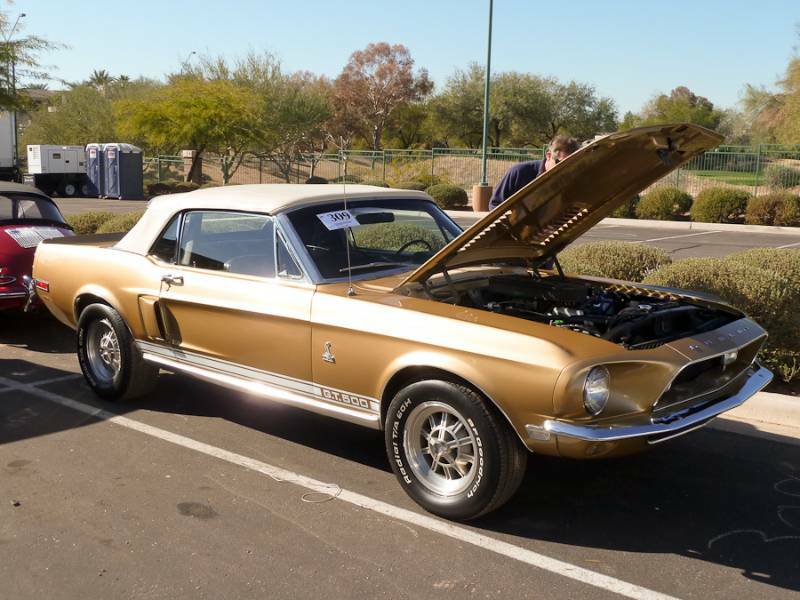 Lot # 309 1968 Shelby Mustang GT500 Convertible; S/N 8T03S178845-02895; Sunlit Gold/Black vinyl; White vinyl top; Estimate $110,000 - $140,000; Older restoration, 2- condition; Not sold at Hammer bid of $88,000 -- 428/360hp, 4-speed, P/S, P/B, 10-spoke alloy wheels, Radial T/A tires, cassette stereo. Restored like new with good older paint, chrome, interior and top. Represented as numbers-matching. No longer fresh, but a very nice tour car. The Shelby bidders were not keeping track of Bonhams' sale and missed the chance to pick up this quality restored 4-speed GT500 convertible. It could have sold for $100K without being expensive. 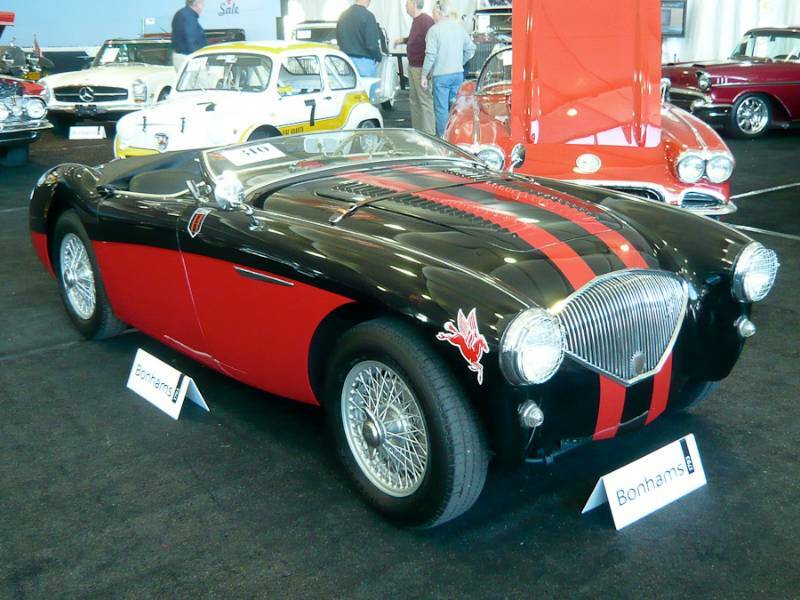 Lot # 310 1956 Austin-Healey 100/4 M Roadster; S/N BN2-L/231026; Engine # 1B/231026; Black, Red/Black; Estimate $90,000 - $120,000; Cosmetic restoration, 3- condition; Not sold at Hammer bid of $80,000 -- Four cylinder, overdrive 4-speed, factory 100M specification, headlight stone guards, silver painted wire wheels, leather hood strap, wood-rimmed steering wheel, competition lap belts. Factory installed M Le Mans kit after purchase by its first owner, then raced by J.C. Kilburn on the West Coast. Repaint shows signs of age with many small cracks and chips. Small bulge at front fenders suggests a front-end bump at some point. Inner rear fenders show some rust perforations and inner door pockets show surface rust. Sheet metal screws strangely have been punched through from the trunk to the inner fender. Updated for modern historic racing with feul cell, kill switch, 4-point belts. Far from pristine but a serious vintage racer. This car had a complete and interesting history but didn't play out as well in the flesh. Had the entire car been original some of the strange fixes and corrosion could have been overlooked or even relished. As it was, the shiny repaint made this Austin-Healey less attractive, like gilding the lily. 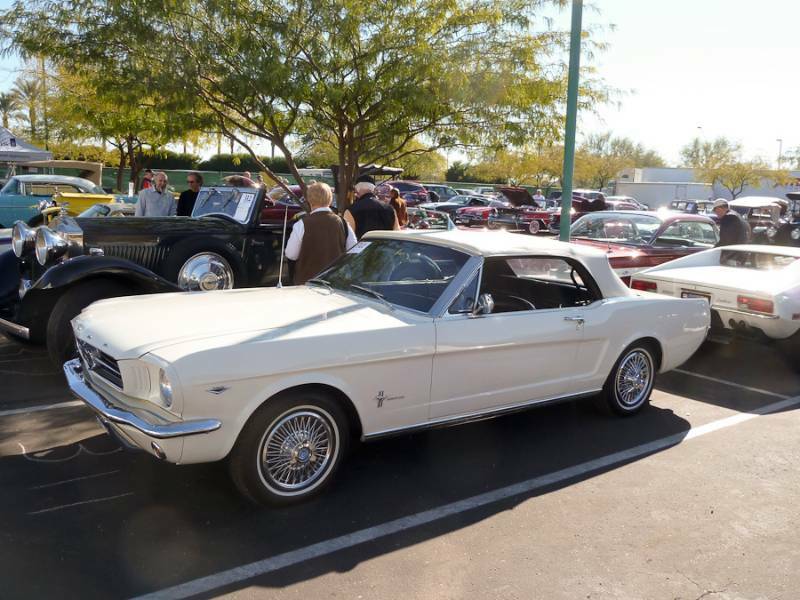 Lot # 311 1964 Ford Mustang Convertible; S/N 5F08D110588; Engine # C6AE-6015-C; Wimbledon White/Black vinyl; White vinyl top; Estimate $30,000 - $40,000; Cosmetic restoration, 3+ condition; Post-block sale at $32,174 plus commission of 17.00%; Final Price $37,644 -- 289/210hp, 4-speed, wire wheel covers, P/S, narrow whitewalls, cassette stereo. Good paint, chrome and interior. Chassis given a lick and a promise, but up to weekend cruiser standards. Early Mustang convertibles, especially the V-8s, are always a reliable purchase. There are plenty of activities for them, many parts suppliers (both new and used) and a ready resale market. This is appropriate money for it, and interestingly is pushing into 2-seat Thunderbird territory. 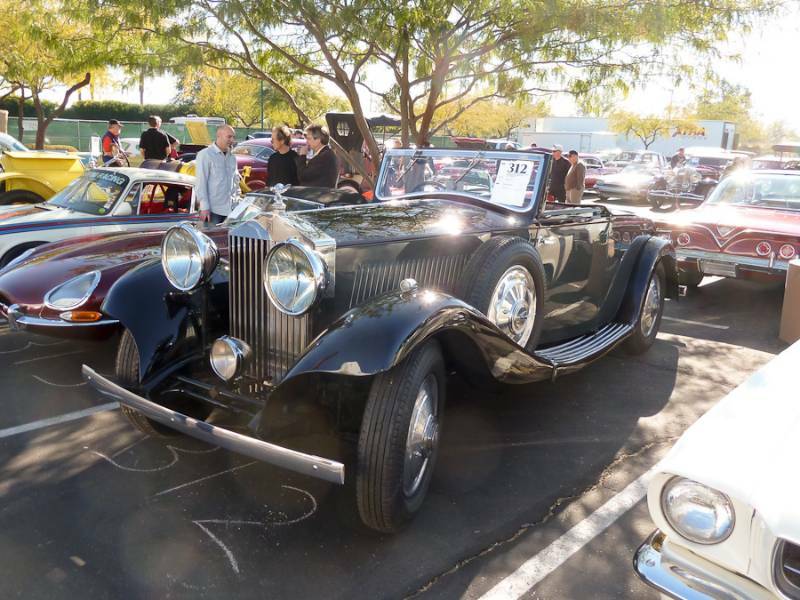 Lot # 312 1933 Rolls-Royce 20/25 Drophead Coupe with Disappearing Top, Body by Carlton; S/N GGA 29; Engine # A8P; Black, Grey/Maroon leather; Estimate $120,000 - $150,000; Cosmetic restoration, 3+ condition; Not sold at Hammer bid of $98,000 -- RHD. Polished wheel discs, blackwall tires, fog light, trafficators. Built for art dealer Arthur Jeffress. Quick old repaint over superficial prep, good interior, erratic chrome. Chassis cleaned up and repainted. An attractive open Rolls in less attractive condition. The Bonhams bidders didn't overlook this 20/25's condition shortcomings and wouldn't match the seller's expectations. It would have cost nearly $115,000 with commission at the reported high bid, more than enough for this car. 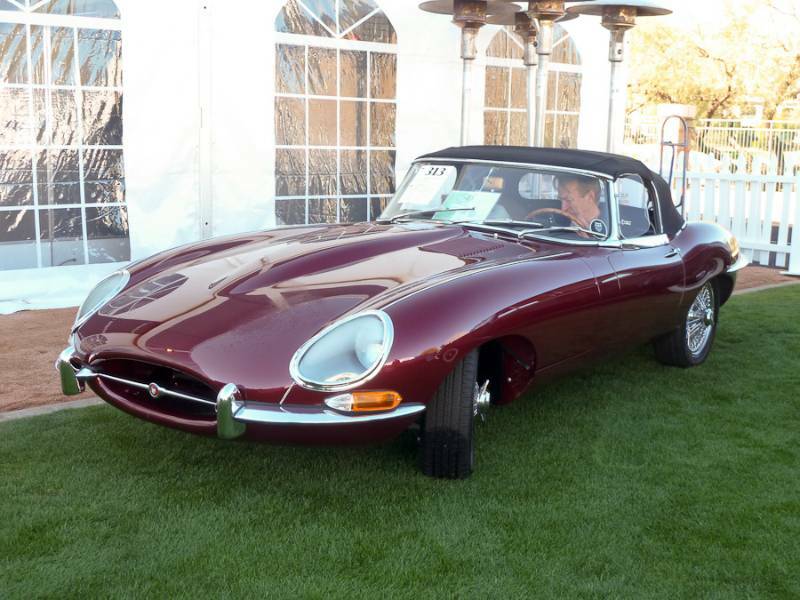 Lot # 313 1967 Jaguar XKE SI 4.2 Roadster; S/N 1E13662; Engine # 7E10521-9; Maroon/Black leather; Black cloth top; Estimate $135,000 - $155,000; Recent restoration, 2 condition; Hammered Sold at $125,000 plus commission of 15.60%; Final Price $144,500 -- Chrome wire wheels, blackwall 185/65R15 Mastercraft tires, no radio. Fresh, shiny restoration, polished up underhood. Excellent cosmetics, freshly done by Classic Showcase in their inimitable style. 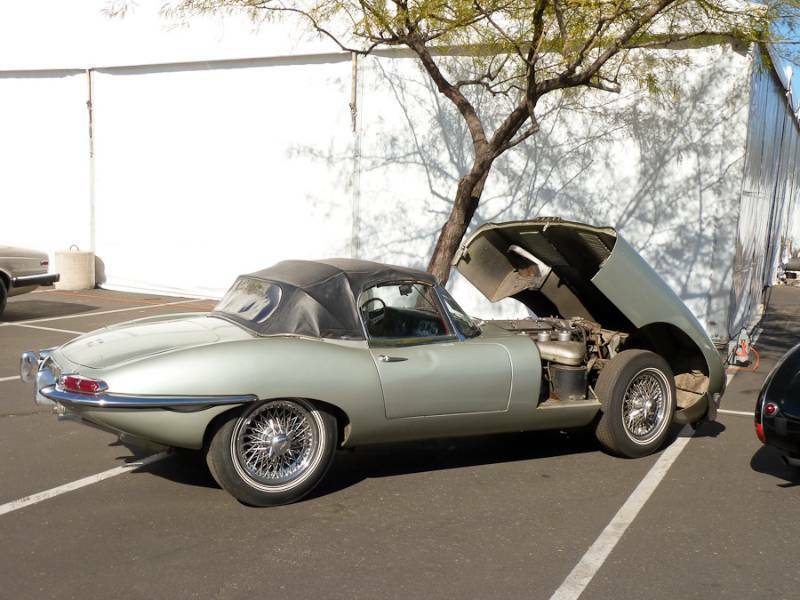 Title reads J671E13662 This is a generous XKE, generously restored by Classic Showcase on their specialist assembly line. They turn out truckloads of a few, selected models each year, know how to do it, know where to buy the right parts and have the skills to produce sharp, attractive cars, as is this one. It brought a superior price, despite the Monkey Ward tires. Lot # 314 1969 Porsche 911S Coupe; S/N 119300089; White ‘Martini’/Black cloth; Estimate $100,000 - $125,000; Competition restoration, 2- condition; Not sold at Hammer bid of $70,000 -- Fuchs wheels, fire system, Formuling leather rim steering wheel. Bored out 2-liter engine, 5-speed transaxle, ZF limited slip, roll cage, 930 Turbo brakes. Good paint with minor chips. Fresh and clean inside. Old undercoat and suspension but looks ready to race. Prepared for Monte Shelton with appropriate attention to detail and safety. To the right competition oriented buyer this uprated 911S would be an opportunity purchase. Unfortunately the opportunity is not at the reported high bid and the car deserves to bring more. Lot # 315 1919 Stutz Series G Bearcat Special; S/N G3096; Yellow/Brown leather; Estimate $45,000 - $55,000; Older restoration, 3 condition; Hammered Sold at $120,000 plus commission of 15.83%; Final Price $139,000 -- RHD. 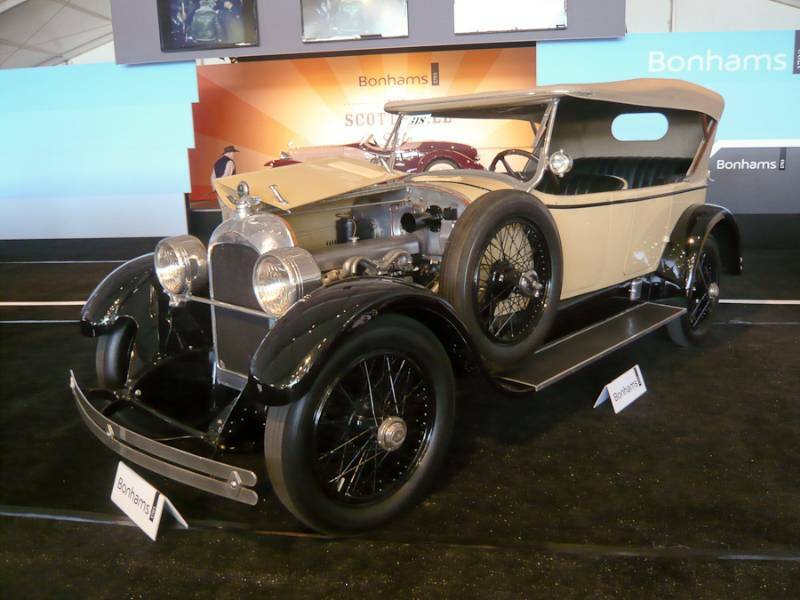 Drum headlights, sidelights, Klaxon electric horn, varnished wood spoke wheels, blackwall tires, Stutz Series G dual valve 4-cylinder, 3-speed Stutz transaxle, electric starter and lighting. A made-up car with chipped paint, seam pulled in driver's seat. A used old restoration in Bearcat roadster style in sound and usable condition. Looks the part, with no worries about ruining an irreplaceable relic. No Reserve. Modestly estimated, the Bonhams bidders recognized this faux-Stutz for what it was, a scintillating drive that will be equally enjoyable around town or on weekend jaunts as it is on tours. It has no history or provenance but nearly limitless possibilities and is, despite its modest estimate, as much car as money at this price. Lot # 316 1962 Jaguar XKE SI flat floor Roadster; S/N 876432; Engine # R3294-9; Silver/Red; Black leatherette top; Estimate $40,000 - $50,000; Unrestored original, 4+ condition; Hammered Sold at $55,000 plus commission of 17.00%; Final Price $64,350 -- Chrome wire wheels, narrow whitewalls, pushbutton radio. Welded louver, inside bonnet latches. Represented as matching numbers. Original throughout, stored since 1976 with a dull old repaint, sound old upholstery, dented console trim, grungy original engine and chassis. A restoration project, but a great one. Originally Opalescent Bronze with Black interior, a color scheme that would vastly enhance its visual effect and value. It's worth a lot more than this restored, although a comprehensive restoration would both be too expensive and compromise its originality. Repaint it in the original color and leave the upholstery in the present dark red and enjoy the heck out of it sounds like the best plan. Lot # 318 1923 Duesenberg Model A Touring, Body by Rubay; S/N 892; Engine # 1260; Cream, Black/Black leather; Cream cloth top; Estimate $175,000 - $275,000; Older restoration, 3 condition; Hammered Sold at $160,000 plus commission of 14.38%; Final Price $183,000 -- 260/100hp straight eight engine, twin spotlights, black leather trunk, painted wire wheels. Formerly owned by William Harrah. Strong older paint. Brightwork well cared for with nice patina. Older but well-cared-for leather is in keeping with the condition of the car. Tire sidewalls showing signs of dry-rot. Purchased by the consignor at the 1986 Harrah's disposition sale and amazingly well preserved considering it was done some three decades ago. Model A Duesenbergs may not pack the same visual punch as the celebrated model Js but they still display the same level of engineering bravado and technical skill that made the marque famous. This was a great car from any angle and it would not have been surprising had it reached its high estimate. A tribute to the caliber of Harrah's restorations, it is a sound value at this price. 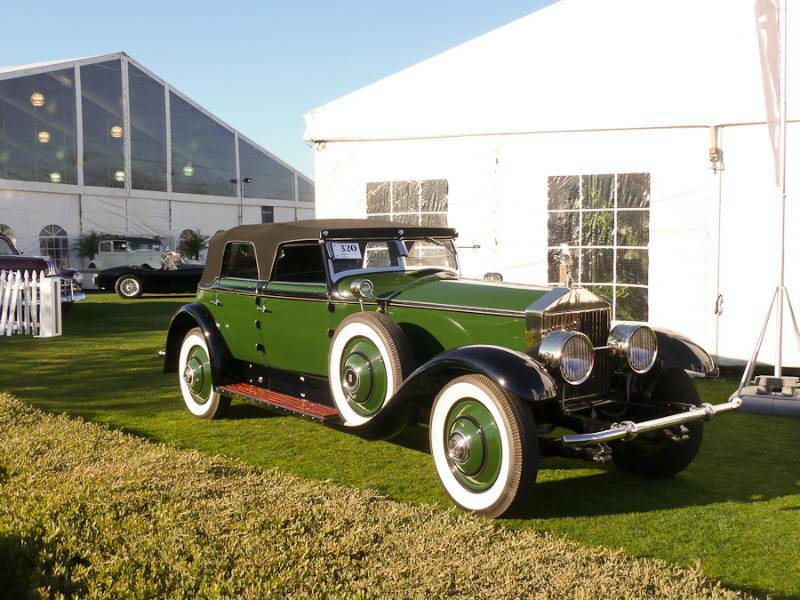 Lot # 320 1930 Rolls-Royce Phantom I Transformal Phaeton, Body by Hibbard & Darrin; S/N S317KP; Engine # 20178; Green, Black fenders and accent/Black; Black cloth top; Estimate $425,000 - $525,000; Concours restoration, 1 condition; Hammered Sold at $470,000 plus commission of 11.49%; Final Price $524,000 -- Lefthand Drive. Green paint flecked with Gold, Gold coachline, body color wheel discs, whitewalls. Gorgeous paint, chrome, upholstery and interior wood. Concours restored and still Concours. Given to Marlene Dietrich by Paramount Studios and Otto von Sternberg in 1930. A car fit for a screen star, restored to the same standards. Acquired by John O'Quinn in 2007 and restored with the same gold-flecked paint that distinguished it in Marlene Dietrich's ownership. Never shown and ready for Pebble Beach. This is one of the stars of the Scottsdale auctions, a superbly and freshly restored Hibbard & Darrin Phantom I that has never been shown. The car by itself is Pebble Beach material. Mixed with its glamorous Hollywood history it is the stuff of legends. A star by any standard, and not an expensive one at that. Lot # 321 1972 DeTomaso Pantera, Body by Ghia; S/N THPNMD04032; Engine # 03002; White/Black vinyl; Estimate $35,000 - $45,000; Unrestored original, 3+ condition; Hammered Sold at $30,000 plus commission of 17.00%; Final Price $35,100 -- Alloy DeTomaso wheels, Becker Europa II AM-FM. Crazed original paint, corroded wheels, sound interior, aged Goodyear Arriva tires. Original engine and chassis. Good chrome. A surprisingly good barn find, mechanically gone through and brought back to running condition and too good to restore. Sadly, most Panteras have been "kustomized" at least with a GTS package of flares, wings and spoilers and an assortment of engine mods. Few exist today in pristine original condition like this. It deserves to be maintained to show future generations how it was when Lincoln-Mercury peddled an Italian hybrid. The price is fair to both the buyer and the seller. 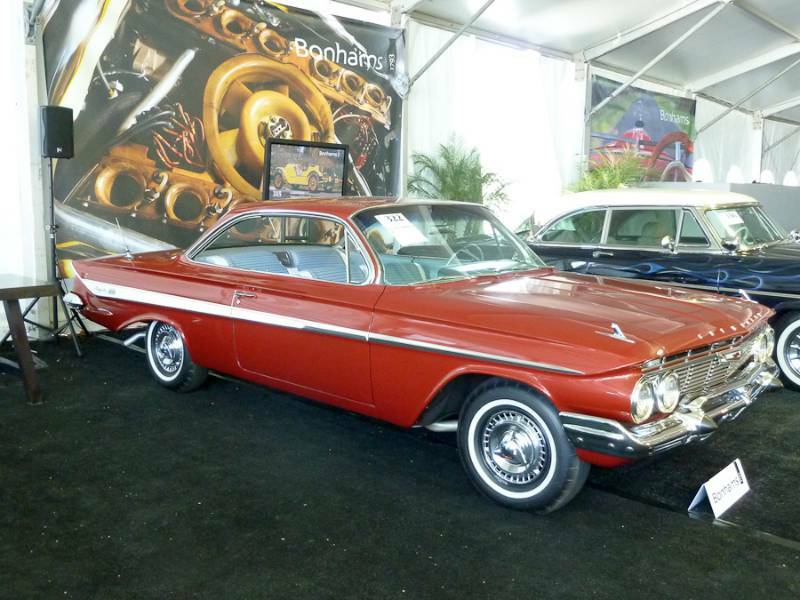 Lot # 322 1961 Chevrolet Impala SS 409 2-Dr. Hardtop; S/N 11837L170677; Honduras Maroon/White vinyl, Grey cloth; Estimate $55,000 - $65,000; Older restoration, 2- condition; Not sold at Hammer bid of $42,000 -- 409/360hp, 4-speed, bench seat, P/B, column mounted 90 degree tach, pushbutton radio, heater, spinner wheel covers, narrow whitewalls. 'Bubbletop' body. Restored like new but with badly waterspotted paint. Good interior and chrome. The paint can be fixed and even at the low estimate this would be a premium car at a realistic price. Lot # 323 1932 Rolls-Royce Phantom II Sedanca de Ville, Body by Barker; S/N 79JS; Engine # CL65; White/Light Blue leather; Estimate $200,000 - $300,000; Older restoration, 3- condition; Hammered Sold at $155,000 plus commission of 14.52%; Final Price $177,500 -- RHD. . Body-color wheel discs, blackwall tires, rollup division, silk shades on division and rear window, smoker's kit and vanity, spotlight, halogen driving lights, dual outside mirrors, windshield visor. A mediocre old restoration, ageing and weak. It's hard to be enthusiastic about this formal PII, and the Bonhams bidders appropriately weren't. It needs so much, and offers so little with its formal body when it's done. The hammer price was appropriate but with Bonhams' nearly 15% buyer's premium borders on excessive. 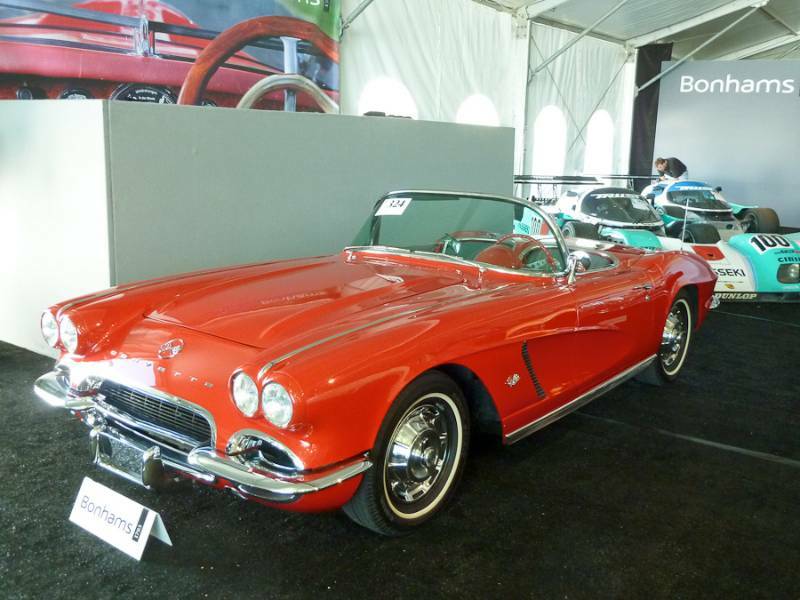 Lot # 324 1962 Chevrolet Corvette Convertible; S/N 20867S100504; Engine # F0132RE; Red/Grey vinyl; Estimate $50,000 - $60,000; Cosmetic restoration, 3 condition; Not sold at Hammer bid of $38,000 -- 327/340hp, 4-speed, cassette stereo, spinner wheel covers, narrow whitewalls. Decent paint, chrome and interior. Orderly underhood. A sound driver quality Corvette. Offered at Bonhams Wally Lewis collection auction in 2011 and reprised here to an audience that was no more receptive. Even at this bid -- $12,000 under the low estimate -- the price with commission would be a pricey $44,460. The 327/340hp engine is desirable, but only into the low $40's. 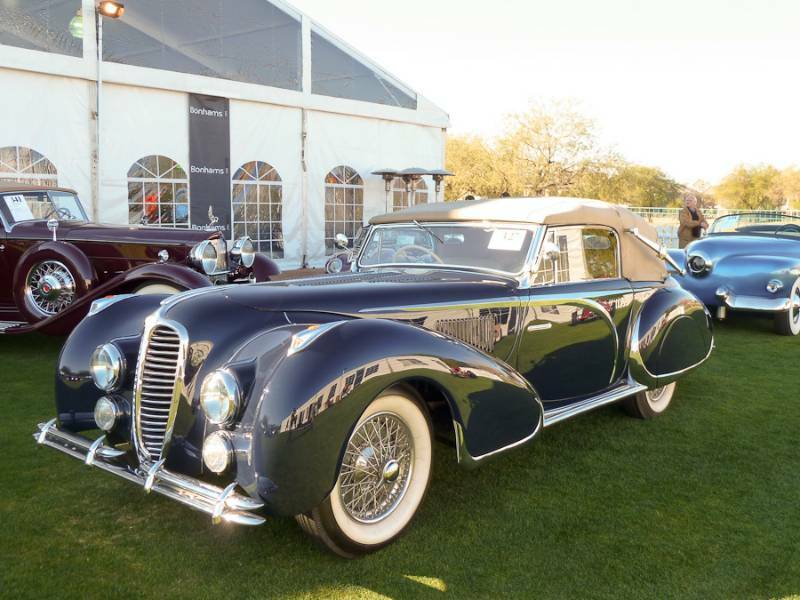 Lot # 327 1947 Delahaye 135M 3-Position Drophead Coupe, Body by Figoni & Falaschi; S/N 800954; Engine # 95200; Dark Blue/Beige leather; Beige cloth top; Estimate $250,000 - $350,000; Older restoration, 3+ condition; Hammered Sold at $425,000 plus commission of 11.65%; Final Price $474,500 -- RHD. Marchal headlights and fog lights, chrome wire wheels, wide whitewalls, dual outside mirrors, skirts, radio, biplane bumpers. Fabulous transparent Orange plastic gauge faces, dashboard knobs and steering wheel center. Good paint and ample chrome, aged upholstery and soiled top. Chassis shows age and use. Modified coachwork with pre-war elements. This car was bright orange, matching its gauge faces and dashboard knobs, when it was offered at Bonhams Quail Lodge auction in 2007. Its current color is more appropriate but less striking. 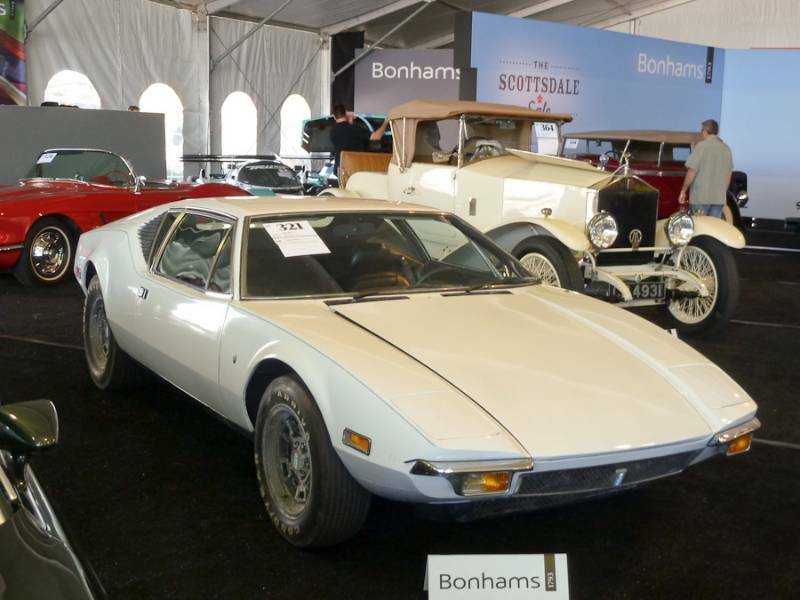 There are some delicious bits, like the front fender marker lights, and details and it was one of the most admired cars at Bonhams' Scottsdale auction, admiration reflected in its price. Some details like Figoni's signature door capping shields are lacking but do little to detract from the car's extraordinary effect.